Marshallese have always been noted for their navigational skills and in the past only a certain few people, either men or women, were even taught the secrets of sailing and navigation. The stick charts were constructed as instructional aids for teaching to preserve knowledge. They were not taken on voyages, for all knowledge was memorized. The charts depict natural phenomena and interpret the wave and current patterns that strike the islands. Long before modern day navigational instruments were brought to the Marshallese, they traveled the ocean, maintained courses and determined positions of islands by the use of wave patterns that are depicted in the stick charts. Very few people today understand these charts, although many people know how to make them. In fact some types of stick charts of today, particularly the two common types of the rebbelip charts, are believed by some old men to be recent introductions that were influenced by modern methods of mapping and plotting positions. The only type that was verified by several old men to be authentic was the wappepe type. There are generally three types seen today: two types of the rebbelip, and the wappepe. The word wapepe literally means a canoe that is floating on the water. The rebbelip illustrates sailing directions for most islands in both the Ratak (eastern) and Rālik (western) chains of the Marshall Islands. Small likajjir (money cowrie) shells are used to depict the island locations. In both types of charts, each straight stick represents a series or pattern of regular currents or waves with the curved sticks depicting the swells refracted by the surrounding reefs of the individual islands. This is a small type of chart which shows the wave patterns that are common around all atolls. The story behind the wappepe is that it was originally brought to the Marshall Islands from Woleai Atoll, located in Yap State which is part of the Federated States of Micronesia. A large outrigger canoe from Woleai was lost at sea and drifted to an island in the Marshalls. The people landed, or were taken by the iroojs (chiefs) of the Marshall Islands to Kili Island where normally no people lived. All the people on the boat were killed except for two brothers. The older brother was taken to Ebon, and he lived there until he died, but he never had any children. The younger brother went to Lae and had one son, Tarmelu, by a Marshallese woman. After his father died, Tarmelu sailed to Ebon to see his father’s older brother, and during this visit he learned about the wappepe from his uncle. 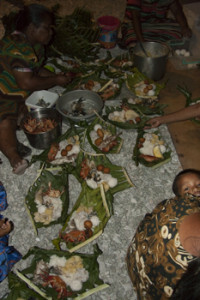 Tarmelu returned to Lae and taught the people how to use the wappepe. So today it is said that the wappepe came from Lae for this is where the Marshallese people first learned of it. Regardless of the availability of the stick charts to learn and study the ocean, the Marshallese have always been able to sail by watching and feeling the movements of the ocean currents and waves, and by using the stars as guides to plot positions. A few older men still know how to use the wappepe, but it is dying out. Several people, though, know how to make it without understanding its meaning. From studying the wappepe the basic currents and wave patterns can be learned. Before sailing, the sailors know in what direction lies the new island. If they are sailing from south to north, then they watch for the main currents from the east and west. Within the first few miles of leaving, the currents are watched carefully to see which one is moving faster. For example, if the current from the east is moving faster than the western current, then the boat is sailed in a more north-easterly direction to compensate for the pull of the easterly current. When leaving an island, the same wave and current patterns are encountered as when approaching an island, but only the wave and current patterns of the approaching island are closely watched. 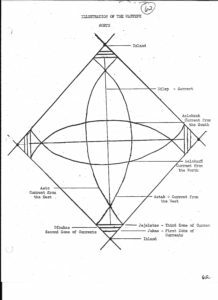 For example, using the illustration, if a canoe sailed from the island in the south, the boat would first encounter the jukae (first zone of currents — nearest an island), then dibukae (second zone of currents), and last jejelatae (third zone of currents — farthest away from an island). All three of these waves together are called no in ālikin bar (waves that come after the reef). As the boat proceeds north it will encounter the place where the aeto (current from the east) and aetak (current from the west) meet. At this point the boat will roll back and forth from front to back with a harder roll to the back of the boat than to the front. The type of ocean at this point is called limaajnono which means choppy seas. Then the boat continues northward and the captain constantly makes sure they do not cross over the aeto (current from the east) or aetak (current from the west) which would mean they were off course. Next the canoe hits the aelokean̄ (current from the north) and then is again in calmer water where the boat mainly rocks from side to side. Then the aelokrak (current from the south) is encountered. At this point very close attention is given to the waves, for the people in the boat know they are now beginning to approach the new island although it is still very far away. The canoe proceeds north and hits the place where again the aetak and aeto meet. At this point the boat rolls back and forth with the front roll of the boat being the strongest, for again the ocean is limaajnono (choppy). This signals that the island is getting close. When the jejelatae (third zone of currents) is encountered the people know they are on course and the island is nearby. Usually the island is visible by the time the dibukae (second zone of currents) is hit. Then the jukae (first zone of currents) appears and the island is very near. There is also a type of wave called dilep which the boat follows when leaving the island until arriving at the new island. All these currents can be seen and felt by experienced sailors. Many Marshallese sailors could lie in the bottom of a canoe and sail by the feel of the waves and currents. Today very few men and even fewer women can sail in this manner, and since few tipn̄ōl canoes (sailing canoe) and walap canoes (large sailing canoe) exist anymore, sailing between atolls has basically stopped. 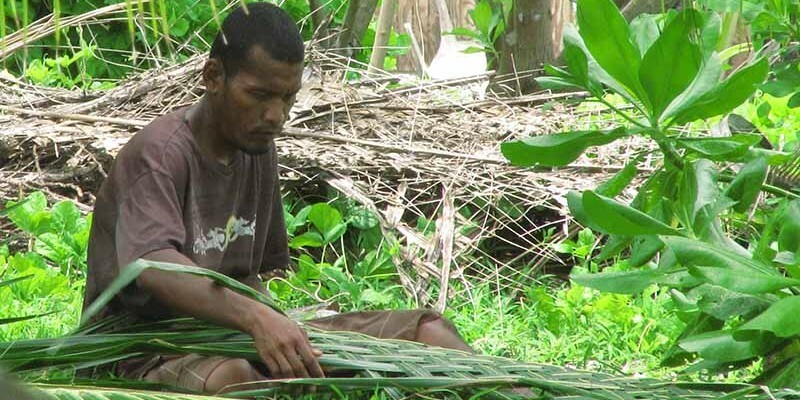 The traditional types of carving and shaping tools used by the Marshallese are called māāl. These are only made today as hand-craft items although the old head parts of these tools are often found in the outer islands. The wood part of the māāls is made from lukwej, kōn̗n̗at, or kaar (types of trees). The head part or cutting part is made from kapwor (giant clam shell) and is attached to the handle with kkwal (coconut rope). Today, for hand-craft articles the cutting part of the māāl is usually made from mejānwōd or en̄ (large type of spider shell). These types of shells wouldn’t be used if the tools were actually made for carving, for only the kapwor is hard enough to resist breaking. Also the edges of the kapwor piece would be very smooth and sharp. The kapwor is prepared by hitting it with rocks to obtain the desired size and then shaping it with the use of the limlim (very hard coral rock). The tilaan (pumice) is then used to do the final smoothing and sharpening of the edges. There are four main types of māāls. This is used to hollow out canoes and for making the jābe (large bowl). The blade is curved from both side to side and from back to front. The edges are very sharp. This type varies from about one and one half feet long to three and one half feet long depending on its use. The piece of kapwor ranges from four inches long, to eight inches long. This is a small version of the jaltok likadkad and is used for hollowing out the small places in a canoe. The kapwor piece is curved in the same way as in the jaltok and is also very sharp. The likadkad is about ten inches long and the kapwor piece is about three inches long. This is the largest type of māāl and is used for cutting down trees. It looks very much like an axe and is made with a large, thick piece of kapwor. The kapwor piece is not curved but flat with a sharp straight edge. 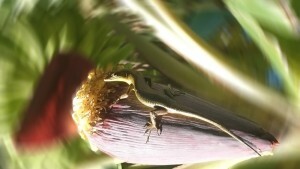 The ūlūl is about three feet long. The jidūl is a smaller version of the ūlūl and is used for finishing and smoothing the surface of wood. It is used like a scraper and has a flat, straight, very fine cutting edge. The jidūl is about ten inches long. The traditional types of drills are now extinct although some older people do know how to make them. 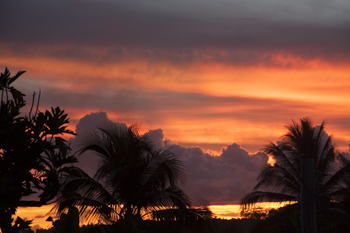 There were two basic types that were used by the Marshallese. These were used for drilling holes in pieces of wood, that were later tied together with kkwal (coconut rope) in making a canoe. Also the ddāil was used for drilling holes in the rajraj (warring spear) to attach the n̄iinpako (shark teeth) and in making other tools. Today more conventional types of drills are available. The simpler type drill was made from one piece of wood about eight to ten inches long with the sides rounded and a small hole at one end. A small, very sharp n̄iinpako was attached with armwe (strong fibers). The n̄iinpako (tooth) was tied on so that only the top sharp point protruded from the wood. Sometimes an addin aorak (finger part of a spider shell) was used for the drill part. To drill a hole, a person placed the ddāil between his hands and moved them back and forth in opposite directions. The second type was the same as the first only with an added circular piece of wood placed around the shaft of the drill to hold it steadier and with an attachment of kkwal and wood which was wrapped around the shaft and made the drill part spin. This type of ddāil was easier to control than the simple type. This is a hammer-like instrument made from kōn̄e (shrub, Pemphis acidula) which is a very hard wood. It was used for hammering wood pieces into very small spaces or cracks in a wa (canoe). The caulking for the canoes was made from liok (aerial roots of the pandanus tree) and was forced into the cracks by hammering with a luj. This type of instrument is not used as a work tool anymore, for more modern tools are available, but is made as a hand-craft product. This is sennit made from fibers of the coconut husk. Sennit is very strong and can be made any length and almost any thickness. 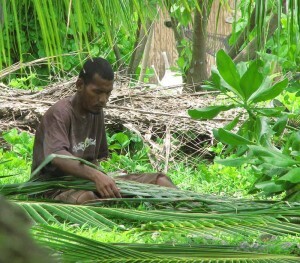 Since originally there were no nails in the islands kkwal was used in almost all construction (houses, boats, clothing) and for all tying purposes. Today kkwal is rarely made so the skills needed to make it are dying out. Kkwal is made from the fibers of the husks of drinking coconuts. The fibers are called roro. They are placed in a pit, lined with coconut fronds, in the sand where the ocean water will wash over them. Large rocks are placed on top to hold them in place. The roro are left for one or two months. This process makes them pliable and separates the individual fibers. They are removed from the pit and washed and pounded until very soft, and then dried in the sun. When completely dried a man takes several individual fibers and places them on his thigh. The number of fibers used depends on the desired thickness of the rope. He rolls them back and forth with his hand until they are tightly intertwined. This is called idrab and each rolled together set of fibers is called an idrab. Next two idrab are rolled together and this process is called kkwal. Kkwal can be made any length by continually adding new idrabs and rolling them together. Today the main urban area and the Capitol of the country is located on Majuro Atoll with a population of about 35,000 people throughout the atoll. With urbanization came all types of businesses, jobs, construction, goods to buy, etc., so orientation to life in the two urban areas (Ebeye on Kwajalein Atoll being the only other urban area) is very different from what is found in the outer island villages. As a result of these changes, the life style has changed greatly and much of the old ways are dying out. For example, very little indigenous produce is available in Majuro and as a result, very little Marshallese food is preserved or eaten. This necessitates a dependence on imported goods, often with little or no understanding of a particular good’s value. The main diet in Majuro consists of rice, bread, canned meats, frozen chicken, sugar, tea and cola although now some produce is now available brought in from the U.S.
Life in Majuro is oriented around money and the realization of the necessity of having jobs in order to survive. 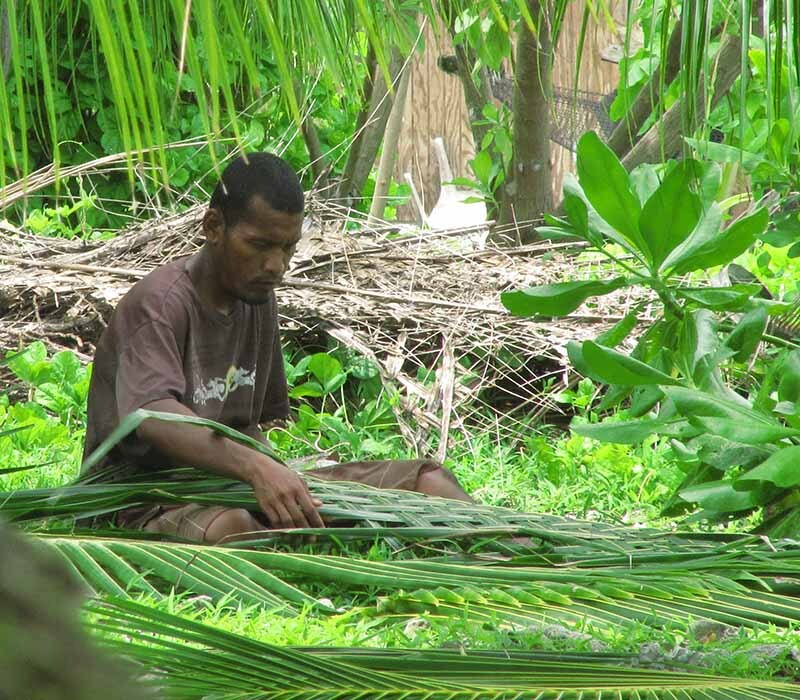 As a result of several thousand people living in Majuro, the traditional land rights and divisions, and uses of the land and its resources, have been drastically altered. 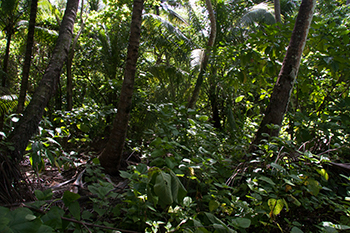 There is little room for the breadfruit and coconut trees, let alone open spaces with no people or houses, and pollution is extensive near the shores of the lagoon. Even with all these changes, people are still very friendly, kind and generous. Within the household unit, although the life style may not look traditional with so many obviously introduced products, many aspects of life, including relationships, teachings, and family structures, are still basically strong and traditional in their orientation. Some of the most familiar names in the Marshalls to the Western world are such places as Kwajalein, where extensive fighting occurred during WWII and where today is located a U.S. Missile Range; and Bikini and Enewetak where 67 hydrogen and nuclear bombs were tested from 1946 until the late 1950s. Kwajalein Atoll is the largest atoll in the world. On the island of Kwajalein within this atoll, is a U.S. Missile Range. As a result of the missile range another urbanized area, Ebeye, located five miles from Kwajalein island, has developed in the Marshalls. On Ebeye live about 12 to 14,000 Marshallese who depend for their livelihood on the salaries generated from employment on the missile range. 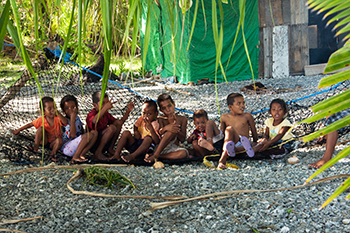 Although Ebeye is much less cosmopolitan than Majuro, the traditional Marshallese life style has been altered by the dependency on money and jobs, and the lack of natural resources. Ebeye is extremely small (approximately 90 acres), crowded, and drab with its lack of trees, open spaces, and superimposed dependency on the missile range. Basically all other atolls and islands in the Marshalls are what is referred to as the “outer islands”. Life on these islands is still orientated to the land and ocean with only occasional outside contact by field trip boats every one to three months. The island of Jabor, in Jaluit Atoll, is slowly becoming a sub-urban center along with Wotje Island in Wotje Atoll since both have public high schools, a few small stores, usually at least monthly field trip ships, and an increasing population. Jabor was the government center during both the German and Japanese periods in the Marshalls. Proudly powered by WordPress Theme: Sketch Child.